Brew2Go is GENIUS! Take that brew to go! No more broken glass. The tumbler has a beer bottle shaped inner wall and comes with a push on covered lid with thumb-slide opening. Keeps invaders out and beer in! A great, functional, conversation piece for the beach, boat, picnics, golfing, pool, outdoor activities and more! Keeps hands dry and beverages cold. Be the hit of the party! BPA FREE! 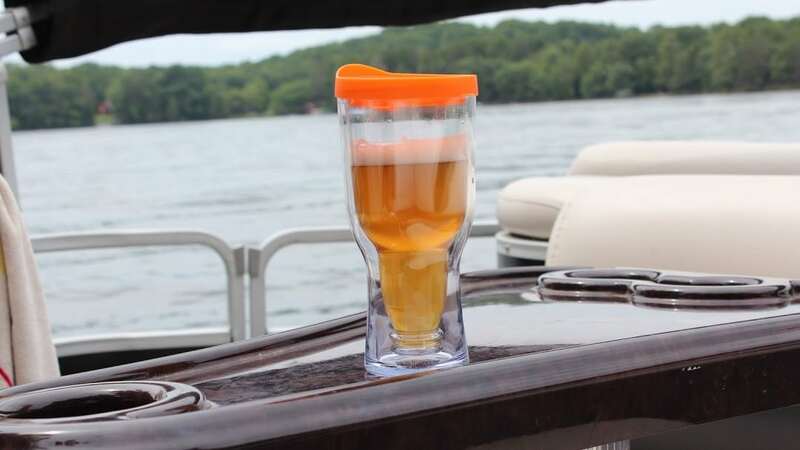 Brew2Go and Vino2Go create durable drinkware perfect for hiking, boating, vacations, and more. From stainless steel reusable growlers to insulated plastic wine glass tumblers, we have all the beer and wine gear you need. Our family business has been supplying clients with cutting edge, top quality, durable drinkware for over 25 years! Each one of our innovative designs has been carefully thought out and well researched prior to manufacturing. We like to think of it as helping the world, one reusable beverage container at a time.